Goldy has a great personality and temperament. 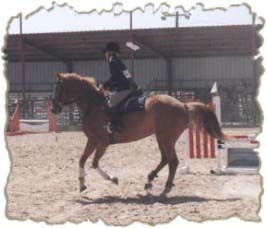 She has competed with success jumping to 3 feet and has completed a novice horse trial. She is schooling up to 4 foot fences. Goldy has been used as a lesson horse, is great on the trail, and has been used to gather cattle. She scored 69.5% at a recent AWS Approvals -8.5% for temperament. Contact Sally for further details.